The following is a set of rules for conducting a Pinewood Derby. Although a set of rules comes with each Pinewood Derby Car Kit, not all areas are covered in detail. These rules are meant to further clarify what may or may not be done to each Pinewood Derby Car during the building process and to help give the Scout a fair chance to bring home the "Checkered Flag." Remember — the focus of this event is NOT to win at all cost, but for each CUB SCOUT to DO HIS BEST and have FUN racing the car HE built (not parent) from the materials in the Pinewood Derby Kit. Adults and others should ONLY GUIDE AND HELP. 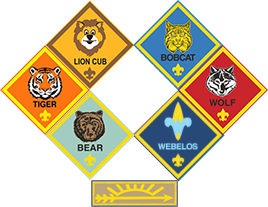 Qualification: All registered Pack 719 Tiger, Cub, and WEBELOS Scouts may design, build and enter a car (only one car may be registered by any Cub Scout) that is eligible to participate in the "Cub Scout Race" event. Attendance and Attire: The Cub Scout MUST enter his own car. This means that the Cub Scout must be present at "Inspection and Registration" to enter his car into competition. The scout must also be present for the races as well as the award presentation following the "Cub Scout Race" event. The Cub Scout must be in CLASS-A uniform to participate. NO EXCEPTIONS. "New Work": Construction of ALL entries MUST have begun AFTER last year's Pack 719 Pinewood Derby Races. No previous year or other club cars will be permitted to participate in the race. Inspection and Registration: Each car must pass a technical inspection before it may compete. Failure to Pass Inspection: The Inspection Committee (consisting of the den sponsoring the event and other den volunteers) shall disqualify cars which do not meet the rules as described herein. If a car does not pass inspection, the owner will be informed of the reason his car did not pass. The Cub Scout may change the car to meet the rules. Post Inspection and Registration: No car may be altered in any way after it has been registered. After a car passes registration, it will be stored at the Pinewood Derby Starters' Table (the judging table). Note: Unsportsmanlike conduct by any participant or spectator will be grounds for expulsion from the competition and/ or the race area. Material: All race cars shall be constructed for this event from the parts contained in the Official Grand Prix Pinewood Derby Kit (referred to below as the kit). Kits may be purchased elsewhere if they are of the exact type manufactured by the BSA as specified above. All car parts and materials must be firmly attached. The only moving parts permitted on the car are the wheels. The car must be free-Wheeling with no starting devices. Wheels and Axles: The car shall roll on the wheels from the kit. The wheels shall turn about the axle nails from the kit. The axle nails shall be firmly affixed to the wood of the car body. The scout may polish the axle nails if desired. The Wheels can be lightly sanded to remove the molding seams on the tread or molding burrs. NO OTHER WHEEL CHANGES ARE ALLOWED. Wheels may not be machined to a beveled condition and the portion of the wheel surface that contacts the track must remain parallel to the axle. Bearings, inserts, sleeves, washers, bushings, or wet lubricants are not allowed. Dry lubricants such as powdered graphite is allowed, please read the lubricant section below. If desired, the scout may change the wheel base (distance between front and rear axles). Wheels CAN NOT extend beyond either end of the car (front or rear). The four Wheels must be placed such that the car will straddle the lane guide and maintain contact with the surface of the track. Size (length/width/height): The finished race car may be no longer than 7 inches, as determined by the official gages during the Registration and Inspection. Underside clearance of at least 3/ 8 (0.375) inches and inside wheel to wheel clearance of at least 1 - 3/ 4 (1.75) inches is recommended, so that the car will run on the race track. The car can not be more that 2 — 3/4 (2.75) inches wide. Adequate clearance is the responsibility of the race car builder. Weight: Finished race cars may weigh no more than five (5) ounces (total weight) as determined on the official scale during the pre-race inspection and check-in. The Weight shown on the official scale is FINAL. Weights: Weight may be added to the car and will be considered part of the car for purposes of ALL measurements. "Weight" is considered to be any material on the car that is not provided in the kit. All Weight must be securely fastened to the car, e.g. by permanent glue, nails or screws, but not by "sticky substances", e.g. tape, or tack spray. Weights shall be passive, i.e. non-movable, non-magnetic, non-electric, non-sticky, etc. Attachments and Details: All attachments and details must be securely fastened to the car, e.g. by permanent glue, nails or screws, but not by "sticky substances", e.g. tape, or tack spray. Attachments and details must be stationary (non-moving). Details such as steering wheel, driver, decals, painting, and interior details are allowed. The finished car — with details and attachments — must meet the maximum length, height, Width, and weight rules outlined above. Cars with wet paint will not be accepted. Gravity Powered: The race car may not be constructed or treated in such a way that the track's starting mechanism imparts momentum to the car. (For instance, this provision disqualifies cars with sticky substances on the front of the car and protrusions which may catch on the starting pin.) The car may not ride on any type of springs (springing). Lubricants: Use dry powdered graphite ONLY for lubricating the wheels. You may not use any other type of lubricant, especially oils and silicone sprays. Lubricants may not foul the track. In the interest of fairness, NO lubrication is allowed once the car passes the pre-race inspection and registration. Behavior: GOOD SPORTSMANSHIP AND BEHAVIOR IS EXPECTED OF EVERYONE. Race officials may ask anyone not following the rules to leave. Race format: Competition shall be head-to-head multiple-elimination competition. The result of each heat will be displayed on an event chart. Finish line judges shall be stationed to observe each heat. All cars will race on all the lanes on the track. Track officials are responsible for the proper conduct of the races. The Race Area: Only race officials and Scouts involved in the current heat may enter the track area. This rule will be strictly enforced. Inspection and Registration: Each scout must bring his car to the Inspection Table. If the car fails to meet any of the rules outlined above, the inspectors tell the scout the exact problem(s). The Scout may change the car to meet the rules.The Scout must be properly dressed in Class-A uniform for the ENTIRE EVENT (inspection and registration through awards presentation). After inspection, official scorers register the car. Call to Race: Competitors are entered into our Grand Prix RaceTrack software upon checkin. Race contestants are randomly called by the software for each Heat. As the next 4 contestants are picked, a car runner will retrieve their cars from the Starters' Table and place them on the track. At the end of each Heat, the car runners will retrieve the cars and return them to the Starters' Table. Car Handling Responsibility: Once Scouts have checked their cars in after official weigh-in, they will NOT be permitted to touch them again unless repairs are needed. Car Runners will be responsible for transporting the cars to and from the Starters Table and Racetrack. Car Leaves Lane: If, during a race heat, a car leaves its lane but proceeds down the track in a manner that does not interfere with its opponent, then the race will be called normally. If the car leaves it's lane and interferes with another car, the race will be re-staged and re-run. If the same car again leaves it's lane and interferes with another car, that car will be judged last place (out of the race - Den or Pack level), and the race will be re-staged and re-run without that car. Car Leaves Track: If, during a race heat, a car leaves the track without interfering with its opponent, it shall be judged last place (out of the race - Den or Pack level). If the car leaves the track and interferes with another car, the race will be re-staged and re-run. If the same car again leaves the track and interferes with another car, that car will be judged last place (out of the race — Den or Pack level), and the race will be re-staged and re-run without that car. Car Repair: If, during the race, a wheel falls off or the car becomes otherwise damaged, then the SCOUT may, to the best of his ability perform repairs with the assistance of his adult partner or Pit Crew member. The car may not leave the race track area. The Scout has 5 minutes to fix the car, or the car shall be judged last place (out of the race — Den or Pack level). No Finishers: If, during a race heat, no car reaches the finish line on the track, all the cars in that heat shall be judged last place (out of the race — Den or Pack level). Every participating Scout will receive a participant award (examples include a Pinewood Derby patch, certificate, or ribbon). The Scout will receive this award on race day. The Scout is responsible for the award once it is presented to him. The car that receive the most votes for winning one of the judging unique appearance categories (Most Creative, Most Humorous, Most Colorful, Best Paint ]ob, Most Patriotic, and so on) will be awarded a certificate. Trophies will be awarded for the second, and third-place finishers overall in Pack 719. You may download a copy of the rules from here.